On Saturday 12 October over 45 volunteers descended on the beach at Wongamat Soi 18 next to the Rim Talay Seafood Restaurant, which was kindly offering use of its tables and chairs for the day. Among the volunteers were members from Rotary Clubs in Pattaya, lecturer in Ecology at Mahidol University Wayne Phillips and his students from Mahidol University, Toi and children from Human Help Network Foundation Thailand, visitors from Argentina, members from The Human Power Foundation, local Thais, Green Pattaya and City Hall. Paul Rogers (wearing hat) from the Rotary Club Eastern Seaboard instructing visiting volunteers from Argentina, Leandro Jesús Bazán and Anita Laurita (center). 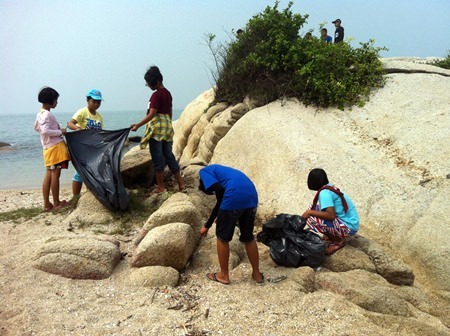 This clean up was different from previous ones because Green Pattaya had sought the assistance of Mahidol University Bangkok to come and help explain the ecological needs of a beach. 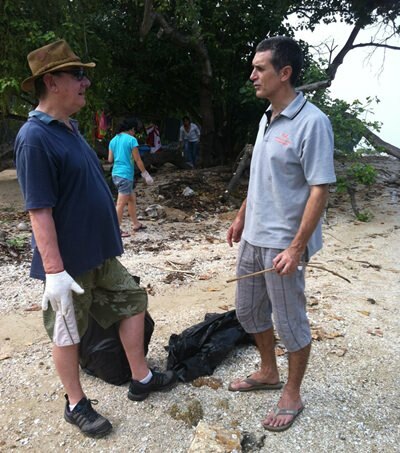 Lecturer Wayne Phillips and his team collected, from a mapped section of shoreline, sand samples and refuse to examine under laboratory conditions back in Bangkok. He gave some immediate observations from his findings: he said the sand had turned black in certain areas because ecosystems had formed inside plastic bags and died due to lack of oxygen, This decomposing matter was turning the sand black. Removing any plastic bags from the sand will help keep the beach its natural golden colour. While cleaning the beach Gary Rasmus, aka KOTO, showed the children the importance of picking up even the smallest plastic due to the dangers it poses to small children and ocean life. Green Pattaya staff provided fruit and snacks for everybody and Kingdom Property provided the drinks. A big pile of rubbish was collected and taken away by Pattaya City Hall, although the beach probably needs one or more cleanups. All the cleaners went to Cheetahs bar afterwards for some well deserved hash. At the Green Pattaya event it was decided not to print our usual flyer but instead give the money to KOTO and his KOTO mobile; it broke down during the last storm and so KOTO has been unable to complete his daily rounds feeding dogs and taking care of homeless people. 3000 THB was handed over during the Green Pattaya Cleanup on 12th October 2013 to repair the car. Green Pattaya is an independent local campaigning organization that acts to change attitudes and behavior, to protect and conserve the environment and create more green areas. The next cleanup is scheduled for the second weekend in November at a place to be announced. 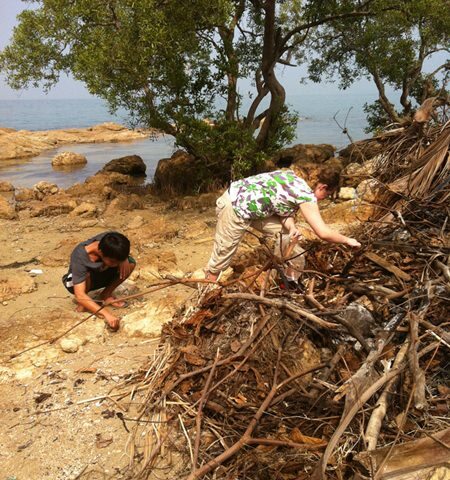 Students from Mahidol University in Bangkok trying to find what is inside 10 SQ M of beach. The result will be presented to Green Pattaya and City Hall. Paul Rogers (with hat) talking to Lecturer Wayne Phillips from Mahidol University in Bangkok regarding their survey of the beach. 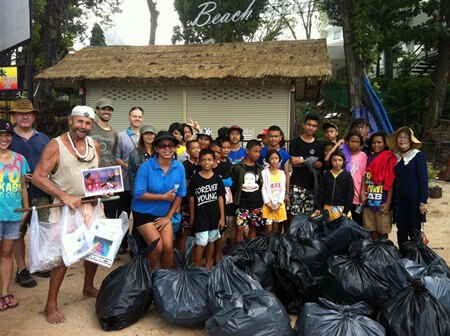 Children from the Human Help Network Foundation Thailand came to enjoy a day out on the beach and helped with the cleanup. Everybody together after the cleaning; the children from the Human Help Network Foundation Thailand and Khun Toy did a great work as always.